Like others in our club, I’m an ‘age-grouper’ and compete for GB at European and international tri events. I’m interested in training, travelling and getting better at Triathlon and the individual sports that make it up – swimming is my biggest challenge as I’ve never really learnt to do laps! Like others in the club, this can be the biggest challenge to any tri distance we tackle. One way around the swimming problem is to do duathlon – run/bike/run and that’s how I started in multi-sports, having come from a running background. I’ve been concentrating on shorter distance as I like to do intensive workouts and races. This type of training fits with my schedule – I’ve a busy job and don’t have a lot of time to train, so I do intensive HIIT sessions with a lot of cross training and strength work in the gym. I’ve had several operations on both ankles – I develop bone spurs regularly and need to get them removed, with the most recent op just before Christmas 2018, so I need to cross-train. I started cycling as a way to do another form of cardio away from running and then found out about duathlon. I was selected for the GB Age Group team in 2017 and again in 2018, which was in Ibiza (very pleasant too!). I also did the Euro Sprint Triathlon Champs in Dusseldorf in 2018 (somehow, I made up time after the swim!) which was a great experience and I got to meet lots of new people in the GB team. In 2019, I’ll be in Kazan, Russia, for the Euro Sprint Tri again (we’ve actually swimming in the Volga river) and am really putting in time with a private swim coach to improve my swimming so I’m not having to chase everyone down quite so much on the bike and swim. There’s a number of different types of champs on offer now – the obvious being triathlon over Sprint, Standard/Olympic, Middle/70.3 and Long/Ironman. Now there’s more annual Multisport champs where there’s tri, duathlon (run/bike/run), Aquathlon (swim/run) and Aqua Bike. I’m looking to get into Aqua Bike in the future too. The age groups are in 4 year categories so you complete against athletes your own age (much easier than going against someone 25 years your junior!) I’m currently in W55-59 and move up to 60-64 in 2020. 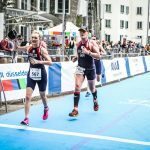 For the mainstream events of Sprint and Standard Tri and Duathlon, you have to compete in one of 3 national selection events and perform to a certain standard. If anyone has any questions, I’m happy to talk you through the process. The benefit of the selection races is: you get to travel to great places around the UK; you have to get organised; you aim to perform at a certain level on a certain day and you get to meet others in your age group and form new friendships. The Age Groupers are competitive as they want to do their best, but they’re also very friendly and cheer on everyone. If you forget something, I’ve always found someone is more than willing to lend you googles, socks, nutrition or whatever you need. I can’t think of a better way to spend my spare time than training and racing. I love to travel and meet others who share my interest in being fit and trying to get better at all disciplines. Come on, White Oak – join in the Age Group fun and race for GB! Next Post: Club Curry Social Night & Club La Santa Meet – Fri 22nd Feb 8pm. Great read Chris. Feeding my aspirations.